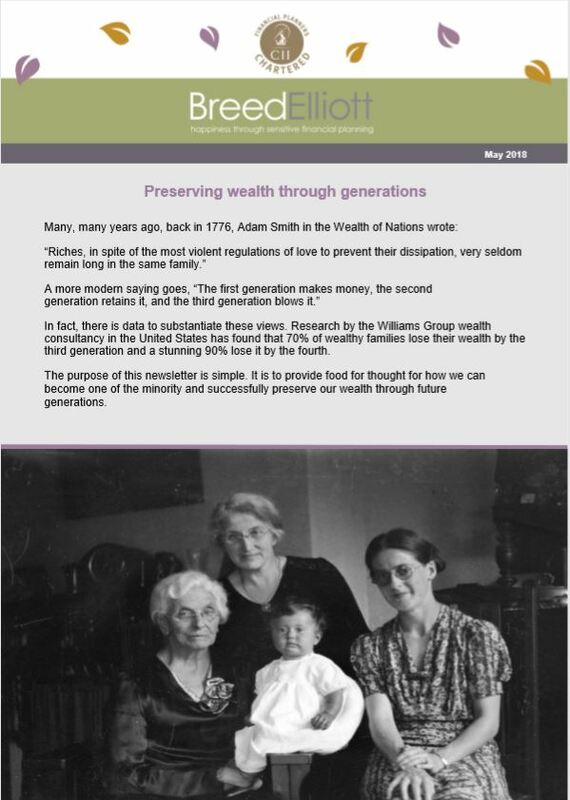 You can download the latest Newsletter here , or any of the Breed Elliott LLP newsletters that you may have missed. 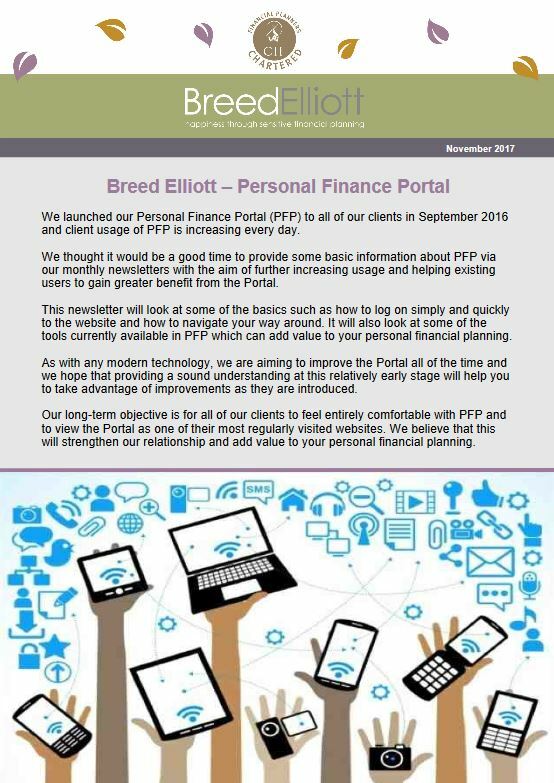 In this, our 160th consecutive monthly newsletter, we have decided to adopt a new means of keeping our clients informed of matters relating to their overall financial planning. 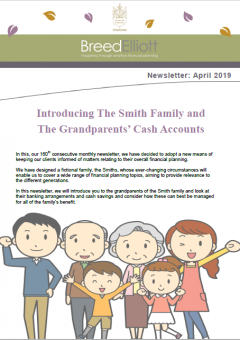 We have designed a fictional family, the Smiths, whose ever-changing circumstances will enable us to cover a wide range of financial planning topics, aiming to provide relevance to the different generations. 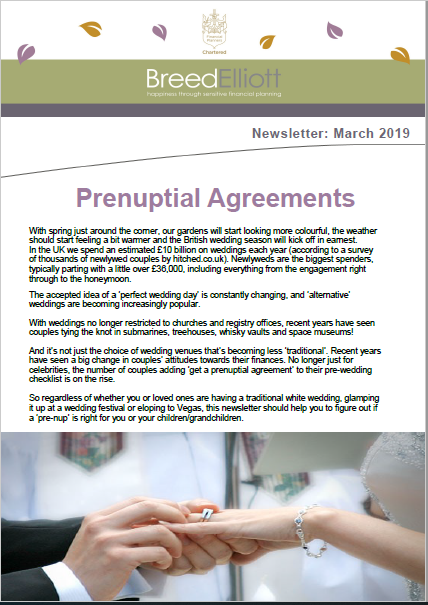 Following on from our newsletter in February which looked at various factors that the younger generation should consider when contemplating the unlikely prospect of their premature death, we thought a natural progression from this would be to look at prenuptial agreements. 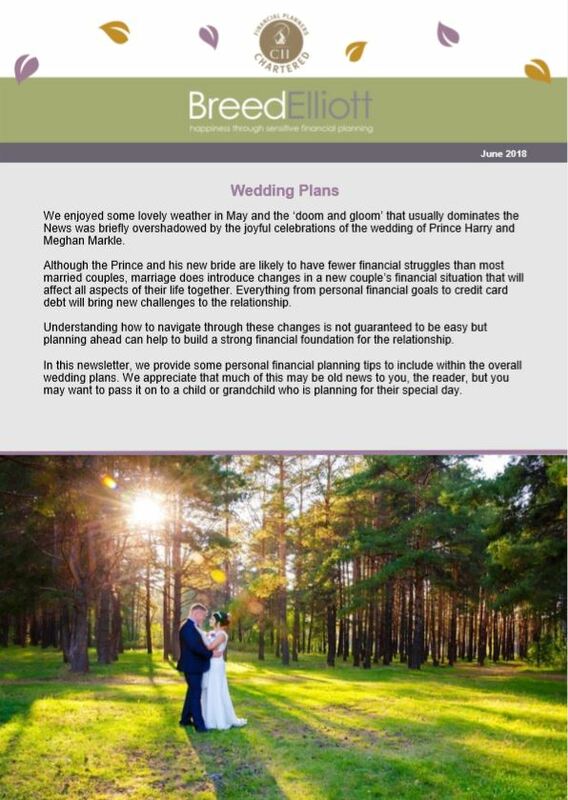 We hope that the newsletter provides some helpful advice for those who might be considering a ‘pre-nup’. Not the cheeriest title, we’ll grant you, but we couldn’t think of anything more pithy! 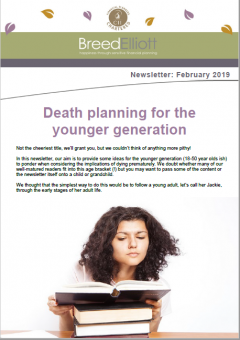 In this newsletter, our aim is to provide some ideas for the younger generation (18-50 year olds ish) to ponder when considering the implications of dying prematurely. The start of a New Year is a popular time to make a resolution to live our lives differently. But forget faddy diets or joining the gym, our advice could leave you better off for many New Years to come! 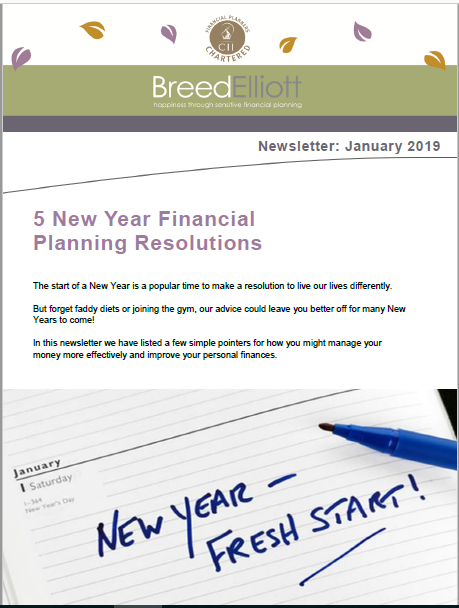 In this newsletter we have listed a few simple pointers for how you might manage your money more effectively and improve your personal finances. As investors, we can choose from two main strategies to generate returns from our portfolio: active and passive fund management. 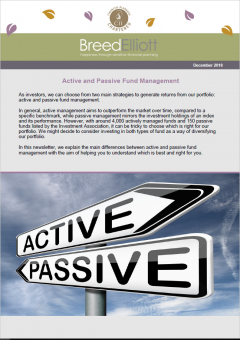 In this newsletter, we explain the main differences between active and passive fund management with the aim of helping you to understand which is best and right for you. 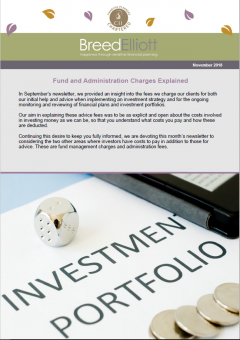 In September’s newsletter, we provided an insight into the fees we charge our clients for both our initial help and advice when implementing an investment strategy and for the ongoing monitoring and reviewing of financial plans and investment portfolios. 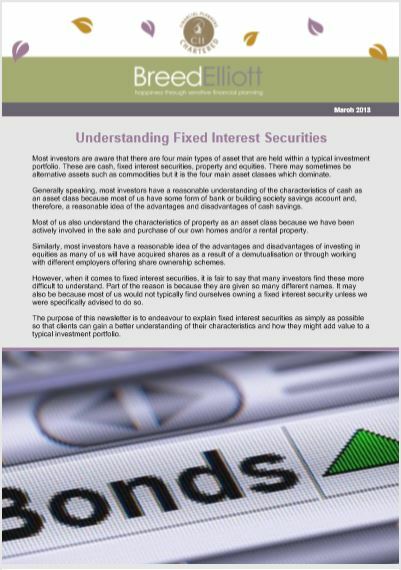 Continuing this desire to keep you fully informed, we are devoting this month’s newsletter to considering the two other areas where investors have costs to pay in addition to those for advice. These are fund management charges and administration fees. We have now completed our analysis of our 13th annual client survey and thought it would be sensible to use this newsletter to provide feedback from this analysis to our clients. We are all becoming familiar with service providers bombarding us with requests for feedback via text messages every time we call them to ask for some of their wonderful ‘service’! We are very aware that people can easily become fed up of constantly being asked to respond to these surveys. 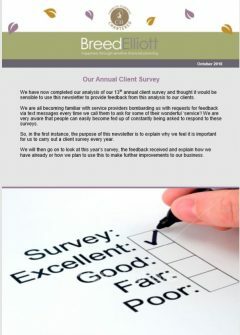 So, in the first instance, the purpose of this newsletter is to explain why we feel it is important for us to carry out a client survey every year. We will then go on to look at this year’s survey, the feedback received and explain how we have already or how we plan to use this to make further improvements to our business. 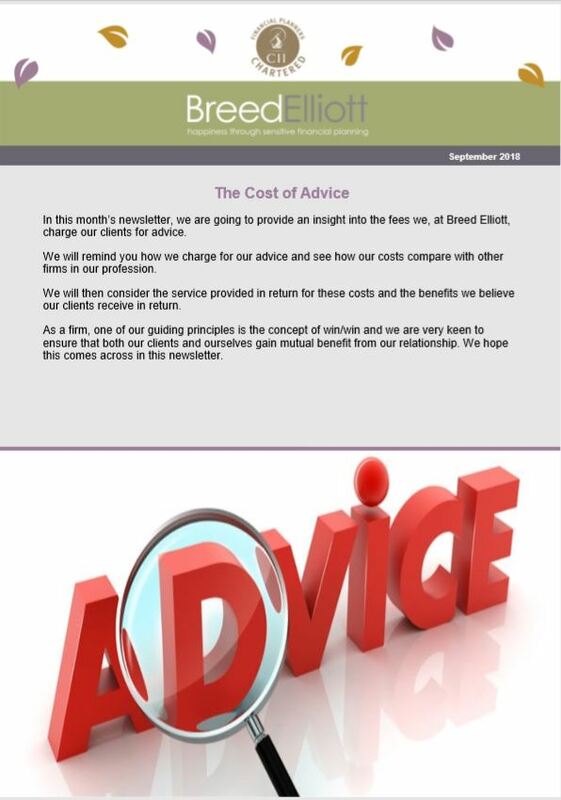 In this month’s newsletter, we are going to provide an insight into the fees we, at Breed Elliott, charge our clients for advice. We will remind you how we charge for our advice and see how our costs compare with other firms in our profession. We will then consider the service provided in return for these costs and the benefits we believe our clients receive in return. 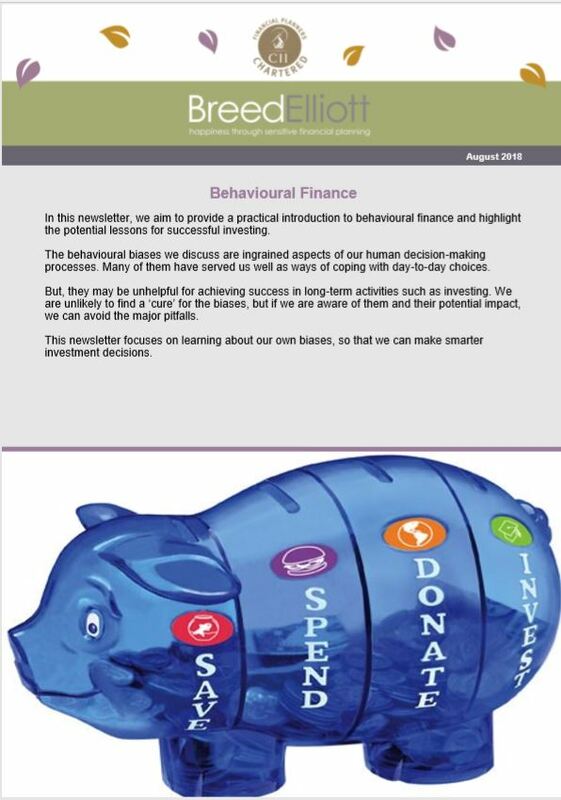 In this newsletter, we aim to provide a practical introduction to behavioural finance and highlight the potential lessons for successful investing. The behavioural biases we discuss are ingrained aspects of our human decision-making processes. Many of them have served us well as ways of coping with day-to-day choices. But, they may be unhelpful for achieving success in long-term activities such as investing. We are unlikely to find a ‘cure’ for the biases, but if we are aware of them and their potential impact, we can avoid the major pitfalls. This newsletter focuses on learning about our own biases, so that we can make smarter investment decisions. 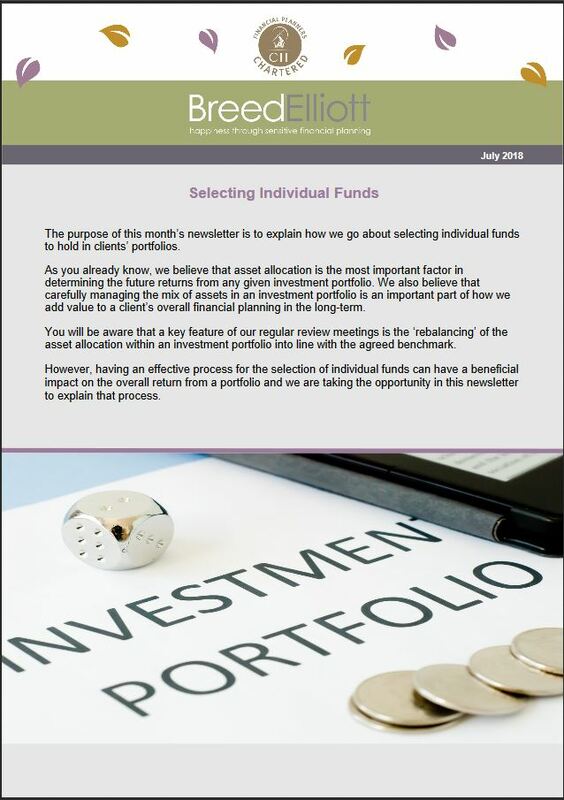 The purpose of this month’s newsletter is to explain how we go about selecting individual fundsto hold in clients’ portfolios. As you already know, we believe that asset allocation is the most important factor in determining the future returns from any given investment portfolio. We also believe thatcarefully managing the mix of assets in an investment portfolio is an important part of how we add value to a client’s overall financial planning in the long-term. In this newsletter, we provide some personal financial planning tips to include within the overall wedding plans. We appreciate that much of this may be old news to you, the reader, but you may want to pass it on to a child or grandchild who is planning for their special day. The purpose of this newsletter is simple. It is to provide food for thought for how we can become one of the minority and successfully preserve our wealth through future generations. We made brief mention about GPDR in our January newsletter. We are sure that you are being contacted by all sorts of different organisations as the enforcement date of the legislation approaches. 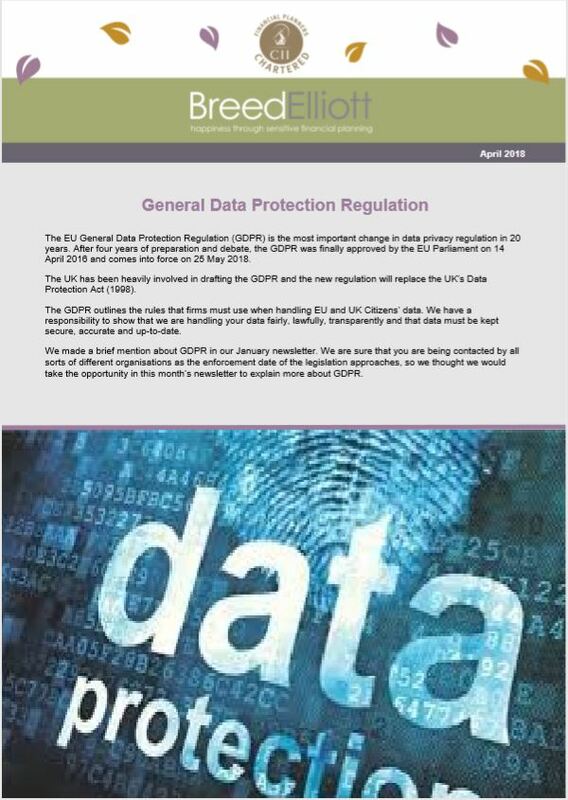 So we thought we would take the opportunity in this months newsletter to explain more about GDPR. Most investors are aware that there are four main types of asset that are held within a typical investment portfolio. These are cash, fixed interest securities, property and equities. There may sometimes be alternative assets such as commodities but it is the four main asset classes which dominate. 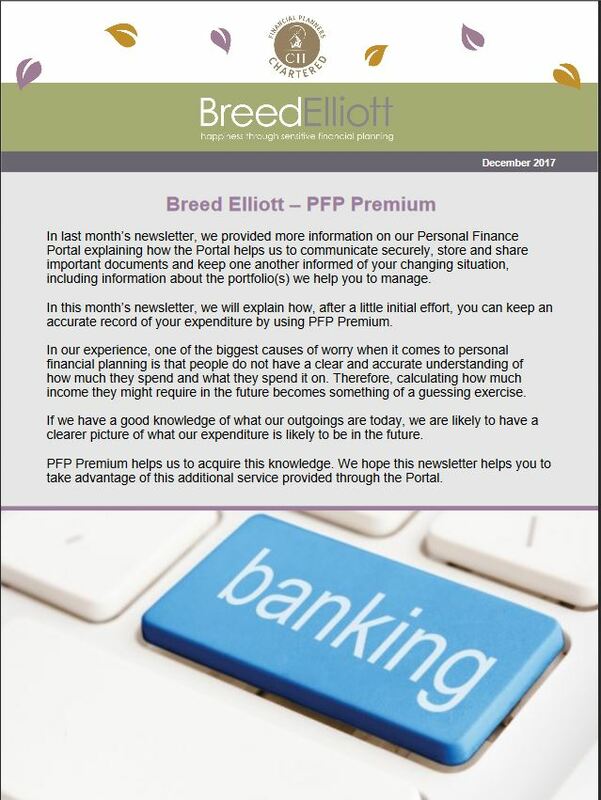 In this month’s newsletter, we will explain how, after a little initial effort, you can keep an accurate record of your expenditure by using PFP Premium. In our experience, one of the biggest causes of worry when it comes to personal financial planning is that people do not have a clear and accurate understanding of how much they spend and what they spend it on. Therefore, calculating how much income they might require in the future becomes something of a guessing exercise. Our long-term objective is for all of our clients to feel entirely comfortable with PFP and to view the Portal as one of their most regularly visited websites. We believe that this will strengthen our relationship and add value to your personal financial planning. Assessing our clients' risk profiiles.